That figures to approximately $43 million per flight, a reduction from the Falcon’s commercial rate of $61 million published on SpaceX’s website. Gwynne Shotwell, SpaceX’s president and chief operating officer, said earlier this month that the company might fly a previously-flown Falcon 9 booster stage later this year. She said the 15-story first stage booster that returned to Earth in December after a Falcon 9 launch with 11 Orbomm communications satellites weathered the up-and-down trip without major issues. “The key is to design a system that you don’t need to refurbish (between missions),” Shotwell said March 9 in a panel discussion at the Satellite 2016 industry conference and trade show near Washington, D.C.. “The key is for us to have zero refurbishment. 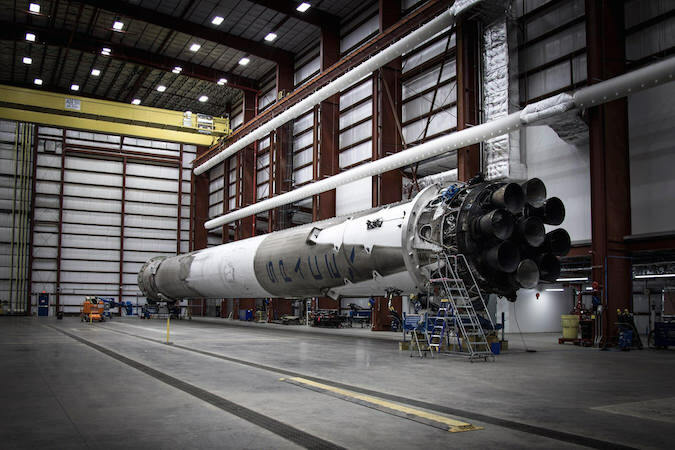 SpaceX does not plan to fly that rocket again, and the company hopes to surmount troubles with landing the Falcon 9 first stage on an offshore recovery barge in the coming months. The Falcon 9 booster has not nailed a smooth touchdown on the football field-sized landing vessel in four tries. The last two attempts failed due to a broken landing leg and an exceptionally high-speed descent, which was required after lifting the heavy SES 9 communications satellite into a lofty high-altitude orbit March 4. 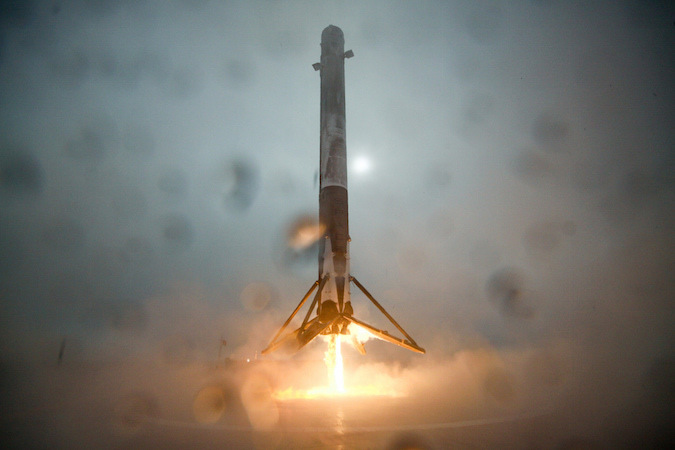 Another barge landing attempt is expected after the next Falcon 9 launch April 8, which will haul a Dragon cargo ship into orbit for the International Space Station. “The plan is obviously to try to recover every one,” Shotwell said. “We won’t recover every one. We didn’t recovery the one from SES 9, although we didn’t expect to either. 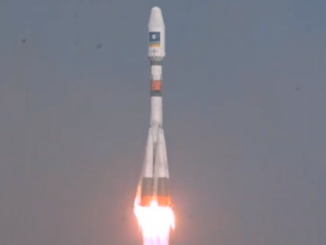 The LEO (low Earth orbit) missions are relatively easy to recover. The GTOs (missions to geosynchronous transfer orbit) are more difficult, but it depends on the size of the satellite, of course. 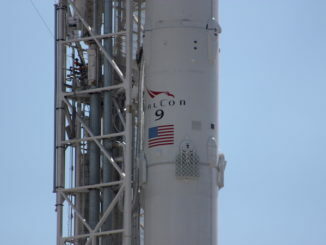 SpaceX introduced an upgraded version of the Falcon 9 rocket with the Dec. 21 launch. The revised rocket configuration has larger fuel tanks and burns super-chilled, densified RP-1 kerosene and liquid oxygen propellants, allowing the launch team to pump more of the commodities into the launcher. The Falcon 9’s Merlin engines also operate at higher throttle settings. Collectively, the changes allow the Falcon 9 to take heavier payloads into orbit, and still have enough propellant reserve to steer the first stage back to Earth for a controlled landing. For lighter satellites heading for orbits a few hundred miles up, the booster could return to a touchdown on land, while Falcon 9 missions with large telecom satellites going to orbits more than 22,000 miles above Earth will only have leftover fuel to continue on a ballistic arc toward a ship on station in the ocean. Even then, communications satellites weighing more than 11,000 pounds, or 5 metric tons, push the Falcon 9’s lift capability to its limits, making a landing maneuver a tougher technical challenge. SpaceX wants to see more successful booster landings before setting prices for launches with used rocket components, but the price is sure to come down, Shotwell said. 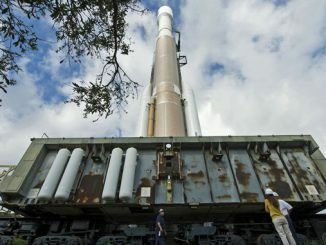 The rocket’s second stage, which has a vacuum-tuned Merlin engine, its own guidance system and flight computers, will still be expendable. The upper stages are left in orbit, or de-orbited to be destroyed in Earth’s atmosphere after their missions are complete. “There is obviously cost there,” she said. As for the price SpaceX hopes to bring to market? But one loyal SpaceX customer wants to see prices pushed even lower. Karim Michel Sabbagh, CEO of SES, one of the world’s largest satellite fleet operators, said March 8 at the same conference that his company wanted a reused Falcon 9 flight for half its current commercial rate — about $30 million. SES chief technology officer Martin Halliwell told reporters at Cape Canaveral on Feb. 23 that SES is eager for the Falcon 9 to take the leap from recoverable to reusable. Halliwell said he does not expect SES to require a demonstration flight of a previously-flown booster before committing an expensive satellite to ride on it. SpaceX is the only major launch company that intends to field a partially reusable orbital-class rocket before the 2020s. Rival United Launch Alliance’s Vulcan rocket, intended to replace the Atlas 5, will initially be fully expendable when it debuts at the end of 2019. By the mid-2020s, ULA aims to develop mechanism to detach the Vulcan’s first stage engines to descend via a heat shield and parafoil for mid-air recovery and reuse. Europe’s new Ariane 6 rocket is on pace for a maiden flight by the end of 2020 to begin the phase-out of the workhorse Ariane 5. It will also be used just once. Arianespace chairman and chief executive Stephane Israel, speaking on the same panel as Shotwell, said his company is staying the course with Ariane 6. The next-generation rocket shares components with Europe’s smaller Vega booster, allowing it to launch at as little as half the cost of the Ariane 5. For geostationary communications satellites launching two-and-a-time on Ariane 6, the translates to prices at around $50 million per spacecraft. Airbus Safran Launchers, the Ariane 5 and Ariane 6’s prime contractor and Arianespace’s majority owner, is studying a rocket flyback concept called Adeline that could be the basis for a future European reusable rocket. Arianespace and SpaceX have won the lion’s share of the world’s commercial launch contracts in recent years, with both firms reaching a fairly even split. Israel said Arianespace’s plans are buoyed with support from customers, who want multiple launch providers competing in the market. Shotwell repeated an often-told joke that some within SpaceX want to charge more for a flight on a used — or “flight-proven” — rocket. “That’s not what Elon or I want though,” she said. “I encourage you,” Israel joked.